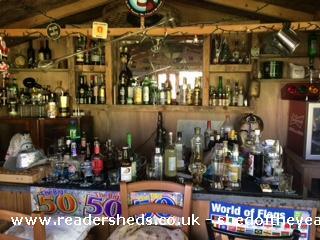 We created the pub shed from materials using the kids playhouse as they had outgrown it! We used our old kitchen units and other materials we have had lying around in garages and garden. We have had many party in the shed with our friends and they all enjoy finding the most interesting drinks and signs when they are on holiday to bring back for the crazy horse. In May 2018 we added an extension, called The Folie Toon which is ski related (as we love skiing) and it has proven to be a great success. We created a beer hatch between the two so you don't miss out on the drinks and entertainment. Our friends made us a ski shot to go in it.